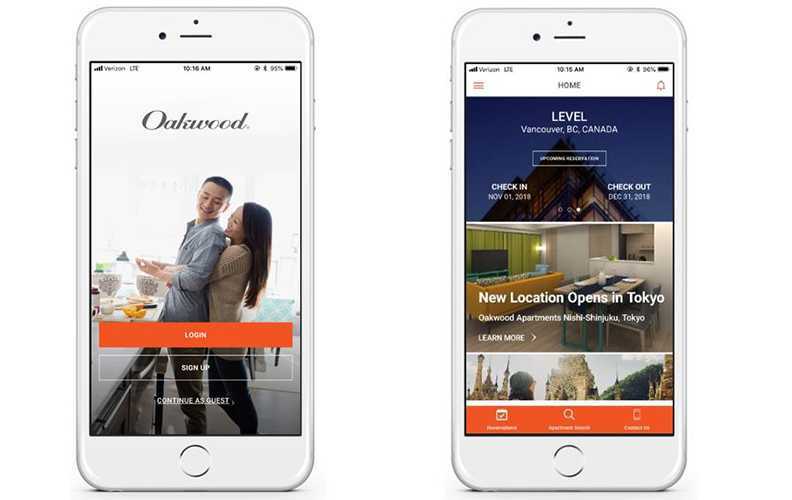 LOS ANGELES, Calif., 2018-Aug-15 — /Travel PR News/ — Oakwood, wholly owned by Mapletree Investments, announced today (Aug 13, 2018) the launch of its proprietary Oakwood Mobile App, a first-of-its-kind app in the industry that streamlines how guests book and manage their travel accommodations through expanded mobile functionality. The easy-to-use Oakwood Mobile App is one of the most robust in its industry, connecting guests to more capabilities than any comparable app. Its features add convenience, simplicity and accessibility for guests, who can now manage almost every phase of the reservation and stay process from beginning to end directly from their mobile devices. As the corporate housing/extended stay industry grows to include leisure, short- and long-term travelers, guests have come to expect an experience that bridges the comfort of a home environment with the conveniences of a hotel. Now, with the Oakwood Mobile App, users can benefit from added booking capabilities, digital document review and signing, secure payment processing and on-the-go access to all reservation details within the app. The introduction of the all-new app is evidence of the company’s commitment to its digital roadmap strategy—announced earlier this year—which focuses on harnessing technology for a better customer experience and value in an ever-changing industry. The Oakwood Mobile App also serves as a new channel of communication for guests, providing users with important alerts and crisis notifications, and enabling them to submit service requests or contact customer care. The first formal announcement of the mobile app launch came from Oakwood on Sunday, Aug. 12 at the annual GBTA convention, the world’s largest gathering of travel professionals. It was unveiled after being selected by the organization to be part of GBTA’s Media Day—a highly coveted opportunity to share breaking news that significantly impacts the industry. The Oakwood Mobile App is available for iOS and Android platforms. Users can visit the Apple App Store (iOS) or Google Play (Android) to download the app, and Oakwood.comto learn more about its capabilities. Oakwood®, a wholly owned subsidiary of Mapletree Investments, is the leading global accommodation solutions provider helping businesses and individual travelersbe anywhere they need to be. With an extensive and flexible selection of move-in ready furnished and serviced apartments, Oakwood has enabled thousands of companies to expand their reach to more customers and markets. The award-winning company continues investing in its exclusive and growing portfolio of Oakwood-branded properties throughout the Americas, EMEA (Europe, the Middle East and Africa) and APAC (Asia Pacific) offering travelers a broad range of accommodation options from apartments with luxurious style and full amenities to sensible accommodations with modern essentials. For more information, please visit www.Oakwood.com. This entry was posted in Hotels, Travel, Travel Apps, Travel Services, Travel Tech, Travelers and tagged Chris Ahearn, Mobile App, Oakwood Worldwide, Shree Khare. Bookmark the permalink.